This programme is designed for total beginners or those with a little experience who would like to have more confidence in the saddle. By the end of the programme you should be happily walking and trotting in open countryside, having learnt good riding techniques from Manolo. He has great horses for beginners and years of experience in giving riders confidence. The Beginners Programme combines riding lessons with trails in the beautiful Spanish countryside and can be done at your own pace. A suggested itinerary is as below. To get a good basic understanding of the rudiments of horse riding then the following programme would give you great confidence. Day 1. Upon arrival, you will be transferred to the hotel where you will discuss the coming week with your guide. Day 2. Today you will learn the basics of riding including riding at walk, turning, stopping and generally controlling your horse. This will be followed by a short ride in the countryside (walk). You will also learn to correctly prepare your horse for riding, including grooming, saddling and handling. c. 2.5-3 hours of riding. Day 3. A riding lesson where you begin to learn how to trot, followed by a ride out (usually walk only). Day 4. Learning to improve your techniques at trotting followed by a ride out (walk). Day 5. Improving control of your horse at the trot and mastering turning whilst trotting. Ride out into the countryside (walk). Day 6. 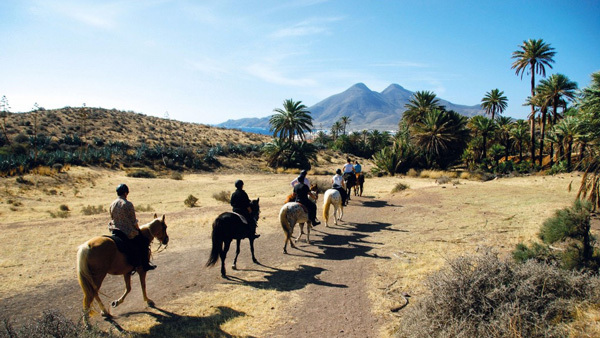 Ride out on the beautiful 'Virgin Beaches of the Cabo De Gata'. This white sand beach has been the backdrop for famous films including Lawrence of Arabia, Indian Jones and The Last Crusade and the adventures of Barron Münchhausen. c. 3 hours of riding. Day 7. After breakfast, you will be transferred back to the airport, bus terminal or train station in Almeria.